Check out these great gift ideas! Quality, affordable gifts for girls ages 2 to 12 from SMITCOfor your girls! Our readers get to save! Get 20% Off Entire Cart Of Gifts! Go to: http://amzn.to/2a3d3v8 and use coupon code N3CQD6AE on checkout Happy SHOPPING!! SmitCo has several different diary sets for girls. The one pictured below has a secret pass-code and comes with an invisible pen ink with a blue light at the top so that only she read what she wrote! All these items are packed in quality packaging. 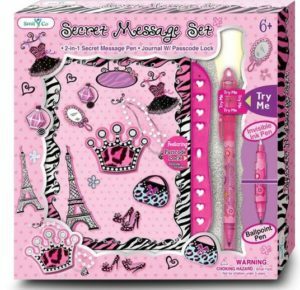 What a great way to encourage young girls to write down their toughts, goals, and secrets? The invisible pen is an awesome added touch. My daughter will love this gift! I am sure you will find some (or all) of your gifts here for the princesses on your list! Our readers get to save! Get 20% Off Entire Cart Of Gifts! Go to: http://amzn.to/2a3d3v8 and use coupon code N3CQD6AE on checkout Happy SHOPPING!! This is a USFamily Guide Sponsored Post. No compensation has or will be made for this post. All thought are 100% my own.